North West Network and Government Office for the North West recently visited ADAS to see for themselves the beneficial work being done and how this is being supported by the European Social Fund. ADAS was founded in October 1997. ADAS stands for Alcohol and Drug Abstinence Service and aims to help people affected by alcohol and drug dependency to break the chain of addiction and reconstitute the family within the community. ADAS is currently being financed by the European Social Fund to provide specialist treatment for alcohol and drug dependant people. 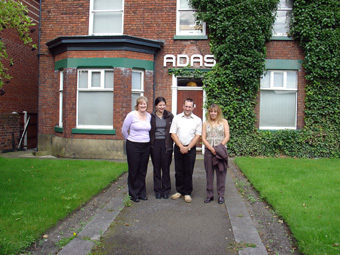 ADAS is the only non-residential abstinence service in the North West. ADAS provides a caring, non-judgmental day care centre for alcoholics and drug users who are dependant on a substance whether it be prescribed or illegal. It could be alcohol, narcotics, tranquillisers, solvents or any other mood altering substance. ADAS has set up basic career training, assistance into further/higher education and employment. Our project visit to ADAS gave us the opportunity to meet, talk and listen to ADAS clients and realise how with the help of ADAS these people have changed their lives completely. Being the only day care non-residential abstinence service in the North West, ADAS gives alcohol and drug dependent people the opportunity to enter treatment, lead clean and sober lives and become proactive members of society. ESFi has provided added value to this project, without which ADAS would not have been able to help those in need and continue offering its services to the community. Among all the moving stories we heard on our visit and the many thank you letters ADAS has received from clients that have benefited form its services, we have selected the following letter which describes how ADAS has changed Val’s life. Before I joined ADAS, 1999/2000 I binged on alcohol and took prescribed drugs, to give me the confidence, to make me more popular, more attractive, more able to face a violent husband, in fact I thought without alcohol or tranquillisers I would appear a failure and seem an embarrassment to those who loved me and a failure to myself. The opposite proved true. Since my five months at ADAS in primary care and the follow up support at aftercare, I now function confidently, my family and friends respect me and most of all I like myself very much and respect myself. Yes it was hard work to even take the first step in recovery and it always is, having to be alert and mindful. But ADAS gave me the tools and my goodness to use them. Waking up in another prison cell or detox centre is not for me today. Listening to people telling me how horrible I am, cruel, nasty, selfish, lazy, violent, day after day is not for me. Now today I hold my head up and walk tall without my crutches, which were killing me. I work and have worked since May 2000, in a large department store, with many and varied other assistants and deal with the public, ‘ladies who shop’ and I enjoy every minute of my work day, because I am able to feel the normal emotions of frustration, anger, elation and even fear especially if I am having to learn something new and dread doing it wrong in front of the public, but today I accept this is normal and I do not use a substance to hide behind. It is not saying everything is wonderful it isn’t. Last year I lost my lovely mum, my best friend and being an only child I had to deal with all the arrangements and the selling of the house. I miss her so much but I am coping. My circle of friends and family has widened so much in sobriety, that support for me has been overwhelming. In a nutshell my time at ADAS enabled me to grow and to share and to be honest. This would have been impossible for me if the clients and counselors had not been such kind understanding and patient people. We as clients felt safe within the environment and shared so many stories of hopeless and sad lives. The staff were and still are the most dedicated and honorable group of people I have ever had the pleasure to be with, without them I would never have been strong enough to overcome my addictions. However, they are task masters a most determined group of people, but with hearts of gold. LONG MAY THEY CONTINUE. I worked hard. They worked hard.